Something about traveling makes me turn into a human vacuum cleaner for junk food. Contrary to my attempts to give myself adult onset Diabetes, I’m normally not a huge fan of large amounts of sugar. Maybe it’s the fistful of Xanax I take to calm down when we fly, or maybe it’s just the delicious freedom of finally having some time away from the Triad, but as soon as I’m securely fastened into my seat on the plane I open my mouth and start my own personal competitive eating contest. I win every time. I spent the entire flight from Atlanta to Seattle with my face all but buried in a bag of Nestlé Fast-Breaks. I went to sleep that night wondering if I would ever be able to look chocolate in the face again without cringing. I made a vow to take it easy on the trans fats for the rest of the trip. The next afternoon we made the vow-breaking discovery that Jack in the Box serves breakfast 24/7. Breakfast as a meal is typically the stuff of legend on our household. We are all of us, Triad included, late sleepers. We’re lucky if we even make it out of the door by noon. 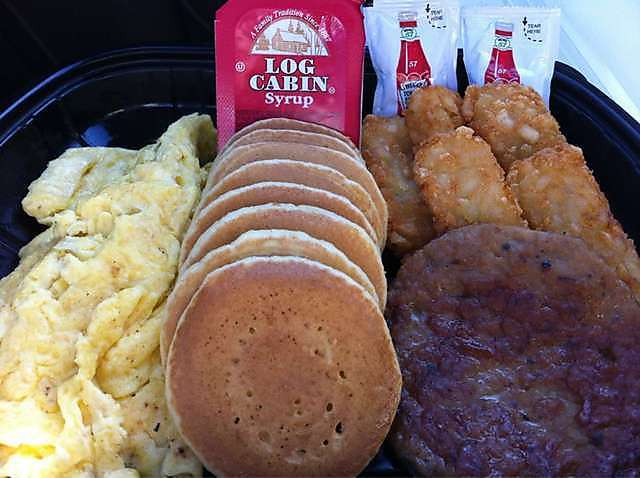 In the area of Atlanta where we live, the latest you can still get breakfast served is 11am. Since everyone knows that any hour before 11am is technically not even a real time of day, breakfast is literally not on the menu. But not at Jack in the Box. Clearly, the universe was giving me a sign. A lady traveler with a passion for passion. It’s Always Sunny in…Los Angeles? © 2019 High-Class Savages. All rights reserved.